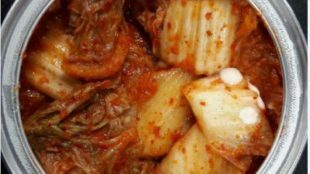 When people think of Canadian food, chances are pretty good they aren’t thinking about kimchee (aka kimchi), a traditional Korean side dish made from salted and fermented cabbage or radish and spices. But one Canadian company aims to alter that perception, with an offering of 14 different brands, including one that is definitely more North American mainstream-friendly. 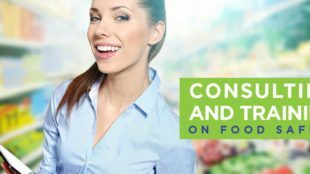 Food For You Ltd., located in Vaughn, Ont. just north of Toronto, operates a new 6,900 square foot facility where it is taking the traditional Korean kimchi recipe and tweaking it to pander to Canadian taste buds. Although production of kimchi products extends back to 2005 when a company root began producing the Galleria brand of kimchi for sale at its retail division Galleria Supermarket, the Food For You business and facility was only opened in September of 2017, with its authentic line-up of kimchi products. One year later in August of 2018, the company launched its The Kimchi, a different blend and processing of ingredients to create a more palatable flavour for the Canadian audience. Cabbage is prepped with a thorough washing in water by staff at Food For You. According to national purchase manager Ethan Kim, the company’s chief executive officer Jefferey Min has always wanted to provide a safe, but authentic kimchi for the general Canadian market, hoping it would not only satiate the palate, but also contribute to further introducing Korean culture and cuisine to the Great White North. Kim noted that while many non-Asians know of kimchi, few have actually sampled it. “We believe that the demand for this super food within the fermented food industry has been growing in the past few years here in Canada and the rest of the world, thanks to the health benefits people have found in it,” said Kim, who added that Min’s Korea Food Trading Ltd. is the exclusive distributor of all products from Food For You. Featuring a shelf life of six months, the 14 Food For You kimchi varieties each possess their own unique flavour and texture profile: cut cabbage; whole cabbage; cubed radish; cabbage and radish mix; ponytail radish; watery sliced winter radish; sliced winter; white cabbage; young radish; watery young radish; mustard leaf; green onion; brined cabbage; and a kimchi sauce. Garbed in production coats from Cintas Corporation and hairnets, boots, masks and more from Uline, employees at Food For You hand-wash spices into the leaves of the cabbage. The white cabbage The Kimchi brand developed by Food For You specifically for the Canadian consumer is processed to include less salt, have a reduced tangy fishy smell, and maintain a sweeter taste profile. Kim said its brands are found across Canada at The Kitchen Table and Coppa’s, as well as Sobeys and Galleria Supermarket, though The Kimchi white cabbage blend is only currently available at the latter two grocery chains due to its newness to the market. As a fermented food product, kimchi delivers a different taste dependent on the length of its fermentation after production. 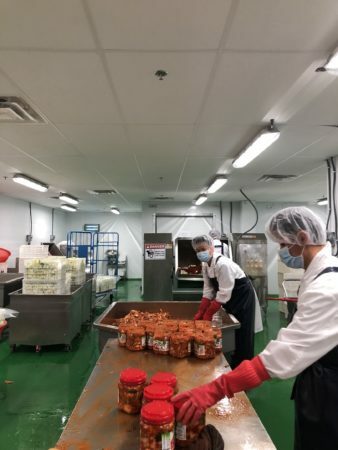 “Eighty per cent of the materials we use to create our kimchi products are obtained fresh from local markets, such as the nappa cabbage and radishes from Yu An Farms in Cookstown, Ont. Peppers, pears, green onions, carrots and onions are purchased through the local Food Terminal, outside sources are required for ingredients such as fish sauce and salted shrimp,” said Kim. “The locally-produced ingredients will provide a fresh taste for consumers and greater options for us, the manufacturer,” said Kim. 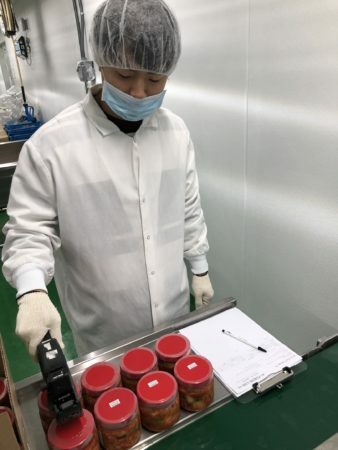 He said that a hidden added value to the brands is the fact that it is produced within the Food For You processing plant—the only Safe Quality Food Institute SQF Level-2 certified kimchi production facility in North America. Food For You workers apply plastic caps from Gogorocket to bottles of kimchi. Even with production of its own varied kimchi brands, Kim said that Food For You is open to performing private labelling services and branding for other companies and stream retailers in Canada, while also customizing recipes to suit any flavour profile requests. The Vaughn facility operates a single line production line, though it is complex enough to divide into three areas. “Our processing area is where we perform pre-treatment functions such as receiving and material inspection, cutting, washing and brining of the fresh ingredients as well as dehydration of the cabbage for 12 hours in a cooler,” Kim said, “while the processing area consists of mixing, seasoning and bottling operations, with mixed content inspected before moving to another cooler for a 24-hour pre-package fermentation process. We then bottle, weigh and cap the product before cleaning the outer container and moving it through our metal detection system. Food safety is of paramount importance for Food For You, notes Kim, as it works hard to train all employees—and guests—to keep the facility safe from physical, chemical and biological contamination. 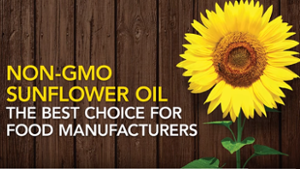 “There are a number of suppliers we utilize to keep our facility and product safe and clean,” said Kim. Food For You utilizes a Loma Systems metal detection system to run all sealed bottles through; Gogorocket supplying the packing materials, Orkin for facility pest control services; Cintas Corporation to provide staff with clean production coats and towels; and Uline for general disposable supplies such as the all-important hair nets, boot covers, masks and more. A metal detection unit from Loma Systems Limited is used on all finished jars of kimchi as part of its SQF Level-2 food safety certification. Scigiene Corporation supplies all of the company’s measuring safety devices and product parameters such as for pH monitoring and salt content, while ThermoWorks supplies other important devices that ensure temperature control and light metering during the fermentation process. 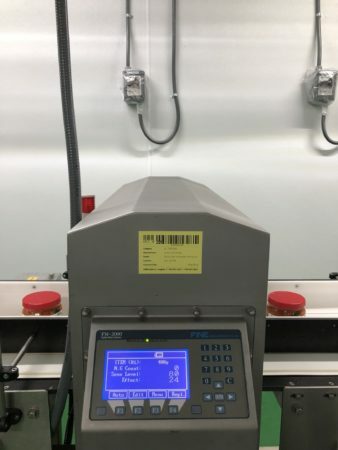 Other suppliers that help keep the facility humming are Maxxam Analytics, which does microbial testing, Rochester Midland Corporation to provide all of the cleaning suppliers to maintain the company’s hygiene standards and Wasteco, which manages who manage the removal of waste from the facility. “We have a special sanitation room that all workers and visitors have to pass through to enter the production area that includes hand-washing stations and a boot sanitizing tub,” said Kim, adding that rubber boots, hair and beard nets, gloves, coats and aprons are provided to all who enter—though visitors are supplied with plastic film boot covers. 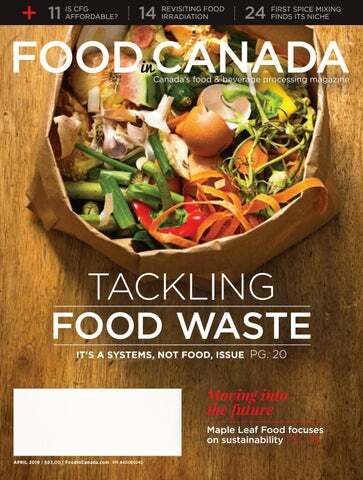 Featuring CFIA (Canadian Food Inspection Agency)-approved sanitizers, soaps and detergents, employees pass through a rigid pre- and between-production sanitizing process, as well as at the end-of-day to ensure all equipment, floors, walls and ceiling are clean and safe for the next-day’s production plans. Lot code and date-packaged information is applied to labels and added to each sealed jar of kimchi. 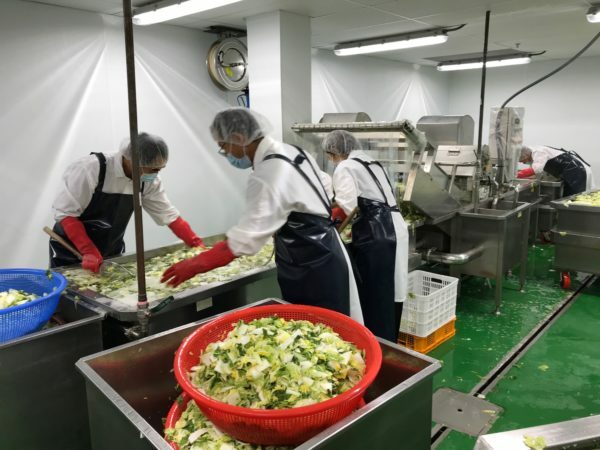 The Food For You production facility’s capacity is 1.5 tons of product per day, but Kim said that the company is ready to upgrade and extend the limits of its production if sales of its kimchi products continue to increase at its current rate. 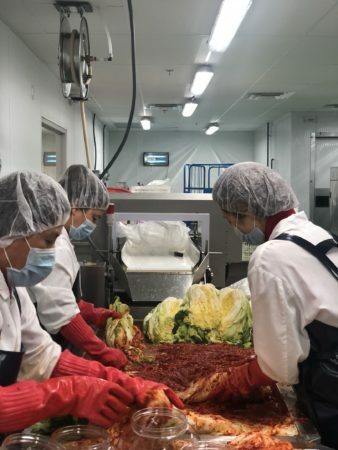 Kim said that thanks to demand for its the Kimchi brand, the Food For You facility operates one shift seven days a week, with employees working a maximum of five days. While the company is SQF Level 2-certified, which includes HACCP (Hazard Analysis Critical Control Points)-certification, Kim said Food For You is currently working on products that can be labelled as kosher or halal, with organic certification coming next.